Did you know that grid-tied solar electric power systems are unable to provide electricity to your home or business when the utility grid becomes unavailable? Even on sunny days? 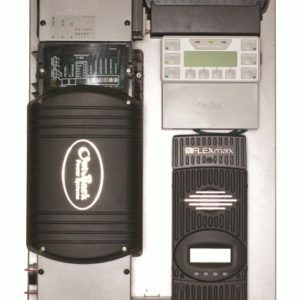 The Outback Power 8 kW inverter package when combined with a battery bank will allow you to connect your existing solar grid tied inverter , up to 6 kW, to provide backup power when the utility fails. This Outback Power AC Coupled package will supply your dedicated loads with power during an outage and allow for your solar array to operate your loads or charge your batteries in daylight hours during the outage. Multiple inverters can be installed in parallel for larger systems. Remote monitoring of Outback systems is possible by connecting the included MATE3 controller to the internet. Learn more here.